Our annual outcomes from January 2018- December 2018 are ready to share. The graphic displays how we realized our two-fold mission of UF student education and medical outreach. 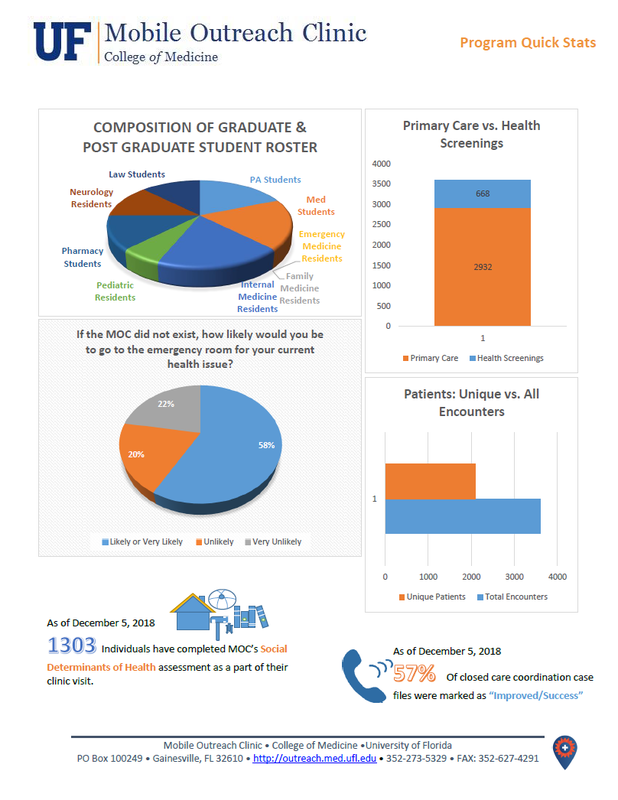 Starting in January 2018, the MOC began screening patients for their social determinants of health at the start of their first visit. We have provided our patients with resources such as referrals to specialty clinics, prescription follow ups, access to the Family Nutrition Program, the MOC Wellness Club, and chronic disease management. MOC’s unique Care Coordination efforts not just improve the skill-base and knowledge of our students, but help our patients achieve their healthcare goals and improve their overall well-being.